Now the fun begins. The eggs must first be cooled before they can be peeled. The key here is to cool the eggs quickly. Why? It is the best way to prevent that greenish ring from forming around the yolk. The green color results from the chemical reaction of iron in the egg yolk with sulfur found in the egg white. When an egg is heated, these two combine to make greeny-gray ferrous sulfide and smelly hydrogen sulfide gas. Rapidly cooling the eggs minimizes this natural chemical reaction. 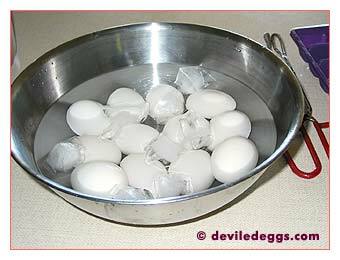 The best way to cool the eggs is by placing them in a bowl of ice water. Personally, I have a separate bowl ready and just pluck the eggs out of the pot of boiling water with tongs and add them to the ice water bowl. Some folks I know just drain the hot water off the pot, add some cold water and toss some ice cubes in there too. Either way, you should obtain the same result. Leave the eggs to cool for about 20 minutes. This should be enough time for them to be ready for the fun part ..... peeling! So, let me share how I peel eggs. You may find this technique makes your egg-peeling experiences easier. 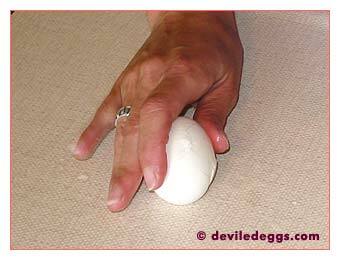 First off, take the egg and give it a few gentle taps on a hard surface. Here you can see I'm just using the kitchen counter. If you tap too hard, you can accidentally smack the whole egg in half, so be careful. 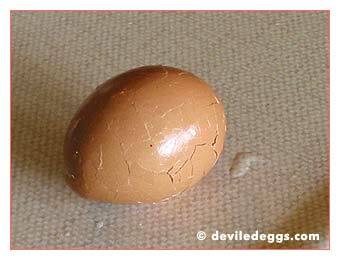 Gently, keep tapping the egg until the shell is fractured-looking all over. The shell will look very broken but you will start to see a whitish membrane underneath still holding the shell in place. Next, place the cracked egg back into your cooling water. Allow the egg to sit for an additional 10 minutes or so. This will let some water seep under the shells to aid peeling. Add the eggs back to the water when you're finished with each one, and by the time you've cracked them all, you can get back to starting to peel the first one you cracked. Now, take the egg at this point and roll it between your palms. The shell and the membrane may even slip off easily at this point. If the shell is a bit stubborn however, it often helps to do this part under cold running water from the tap. 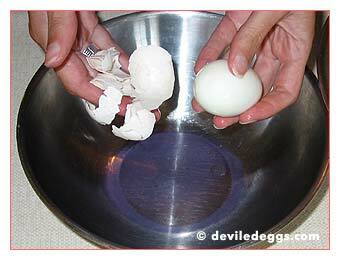 Hold the egg in your hands under the running water while you ease the shell off. You may need to gently start the process off by picking a small bit of shell off with your fingernail. Then the egg shells should slip off perfectly. You will be rewarded with a plateful of perfectly round, smooth eggs! Finally! We're ready to start making the deviled egg filling!